While car designer Boris Jacob was pointing out the various clever bits of the Opel Flextreme concept car last week, we couldn’t help feeling a bit sorry for him and others of his profession. They spend their lives dreaming up beautiful one-offs, replete with clever flourishes, and most never subsequently reach the road. We asked if this was ever a bit depressing. Jacob insisted that it never was - mainly because all the really elegant and clever bits of work aren’t forgotten, but are patented, and appear eventually. And we could tell he was being honest, rather than trying to look on the bright side, because he’s evidently not a very good liar. Earlier we’d asked him what he thought of the Vauxhall brand and logo compared to the Opel marque and insignia, which produced a frown, some non-committal noises, and then an awkward silence. Another GMer stepped in to say that every designer has their favourite brand and that the Vauxhall griffin looked really good on the Speedster (or VX220, in Vauxhall-speak). This patenting of concept cleverness no doubt goes way back, and patents tend to last a long time - 20 years in the US or Europe. Which no doubt means that all the carmakers have arsenals of extant patents. Critics of the patent system argue that this kind of build-up simply raises the bar for new entrants, making it harder to enter a market. Established firms tend to amass lots of patents covering technologies that all their rivals need to use, so cross-licensing agreements are common. In effect, everyone ends up swapping intellectual property rather than paying each other royalties that would sum more or less to zero. New entrants, by contrast, tend to have few patents, so they end up paying licensing fees to everyone for everything. We wonder whether this patent problem will bite Shai Agassi’s Better Place startup, which has plans for electric cars that hinge around replaceable battery packs. 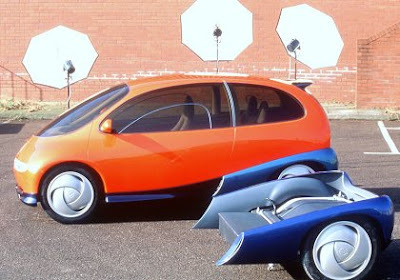 When we asked Jacob if he thought it would be feasible to design a car with a replaceable electric heart, he thought for a moment and recalled that his firm had done something similar before, in the shape of a concept car called the Opel Twin. Shown off at Geneva in 1992, the Twin had not just a swappable battery, but a swappable drivetrain. Designed to run on either electric power or a petrol engine, the Twin featured a removable pod at the rear housing all the oily bits as well as the rear wheels and suspension. The idea was to accommodate zero-emissions motoring around town, with longer-range ability when required. It never made production, obviously, but did Opel patent the technology? And will it be sticking its hand out for royalties if Agassi's plan takes off?